Every year Sweet Mountain Farm is inundated with beekeepers who waited too long to order bees. 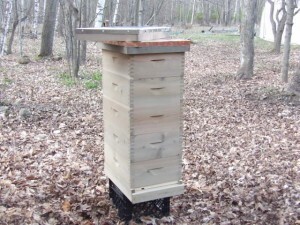 Don’t wait until spring to order your colonies or hives. Now is a perfect time to make your choices and customize that hive. Don’t delay. We have beautiful Cedar hives MADE IN WISCONSIN. Before you purchase from a megastore, consider doing business with a local family business. Get to know us and take pride that your hive is built in the USA! CERTIFIED SOUTHERN bred stock will be available for pick up on May 19, 2018. The nucleus is a complete colony with drawn comb and bees in all stages of development. Colonies are raised in the South. This means that the colony you are purchasing was started in March and is roughly two months ahead of northern bred bees. Each nucleus consists of five frames. One frame is slightly drawn and is used for expansion and transport. Each nucleus will have approximately 2 frames of honey/pollen and 2 frames of brood. The colony is packaged in a portable transport box made of plastic Correx that you may keep. 1. Nucs sell out quickly. Order early! 3. Cancellation before 3/31/18 is refunded less $20 per nuc. Green Bay, 11:00 a.m. – 12:00 p.m.
Sturgeon Bay, 1:00 p.m. – 1:30 p.m. Sister Bay, 2:00 p.m. – 2:30 p.m. The craftsmanship is remarkable and the hive is designed by me for my Russian honeybees. 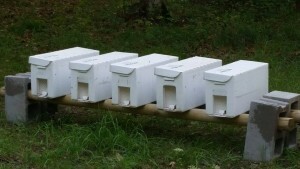 There are lots of features included that make this hive an optimal environment for honeybees. Customize your outer cover and hive coating.